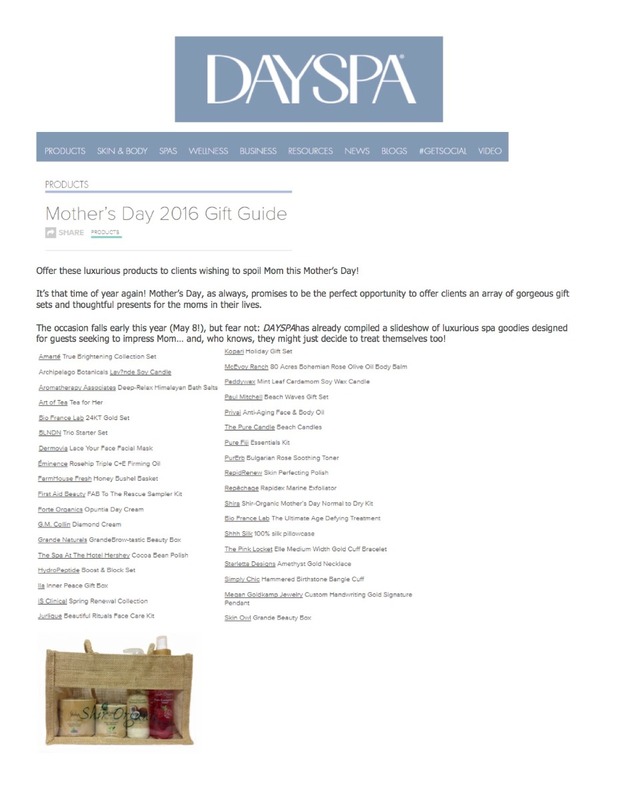 For a Mother’s Day product round-up, Shir Oganic bundle of items including Shir-Organic Blueberry Night Cream, Shir-Organic Cucumber Eye Cream, Shir-Organic Coconut Oatmeal Cleanser and Shir Organic Pomegranate Toner in a jute bag were featured. 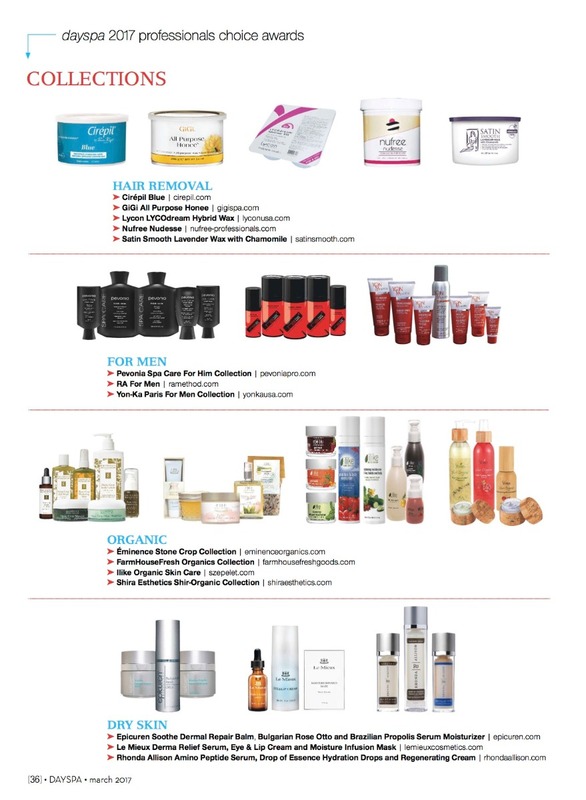 Day Spa Magazine included Shir-Organic Pure Eucalyptus & Cocoa Anti-Cellulite Gel in a round up of summer items! 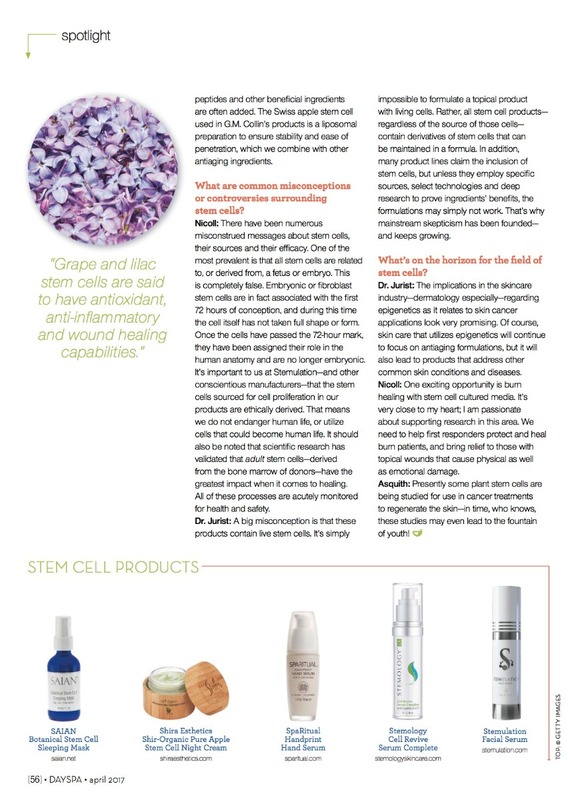 On page 56, Day Spa Magazine included Shir-Organic Apple Stem Cell in a Spotlight on Stem Cell products article. 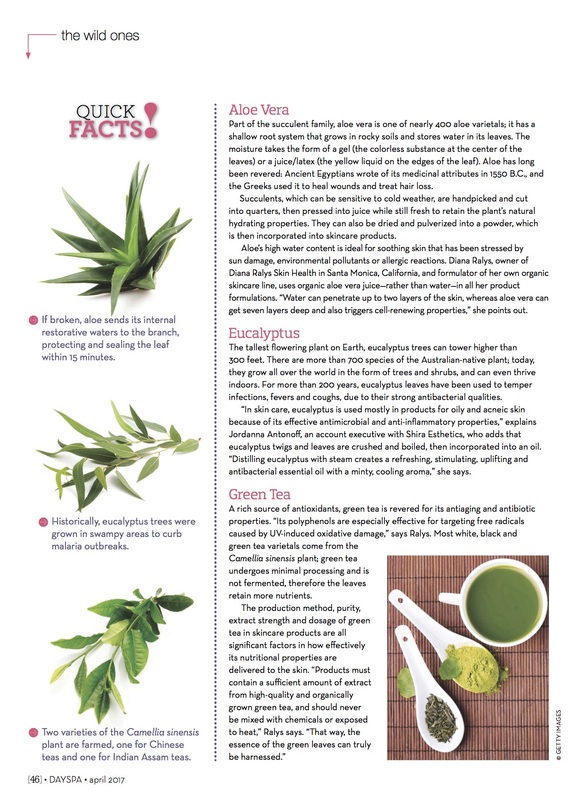 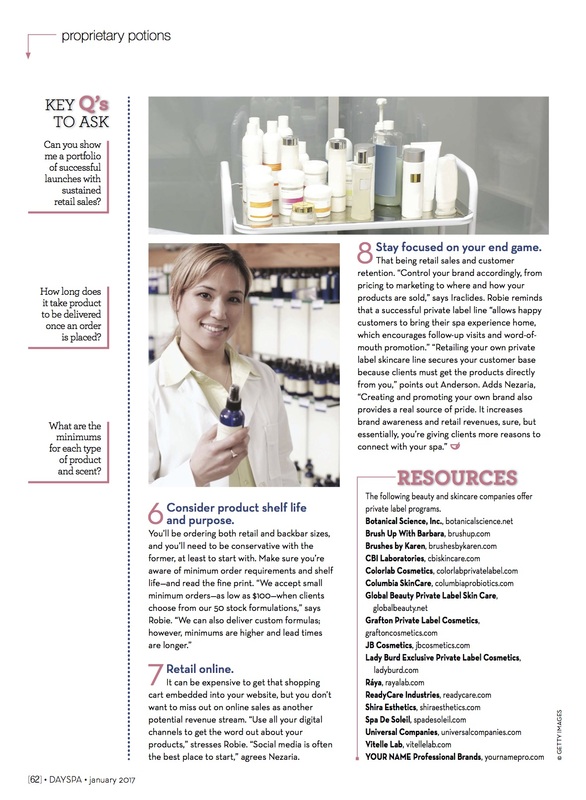 On page 46, Day Spa Magazine included a quote from our educator, Jordanna Antonoff, about Eucalyptus, the main ingredient in our Shir-Organic Eucalyptus Cleanser in an article about botanical ingredients. On page 47, the Boto-Derm Instant Lift Serum is one of the product suggestions following an article about peptides. 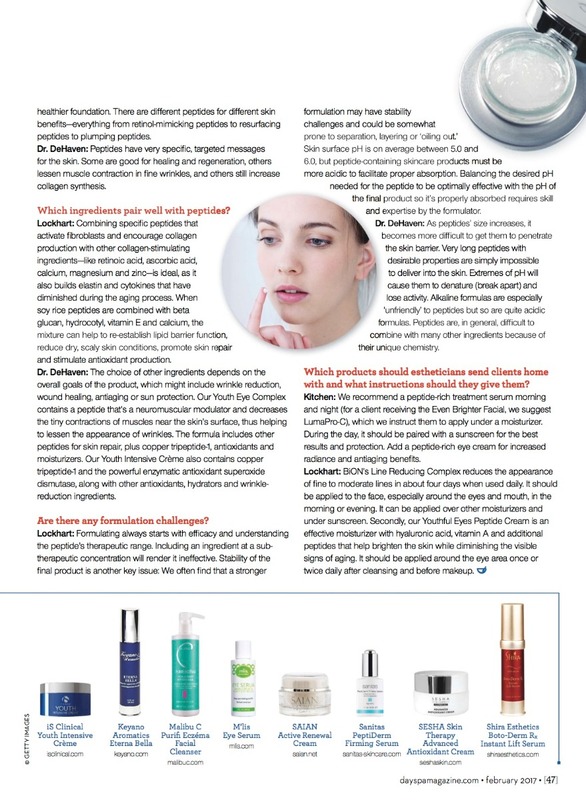 Shir-Radiance Ester-C Brightening Serum was included on page 59 as part of a featured round up of skin products that illuminate the skin. 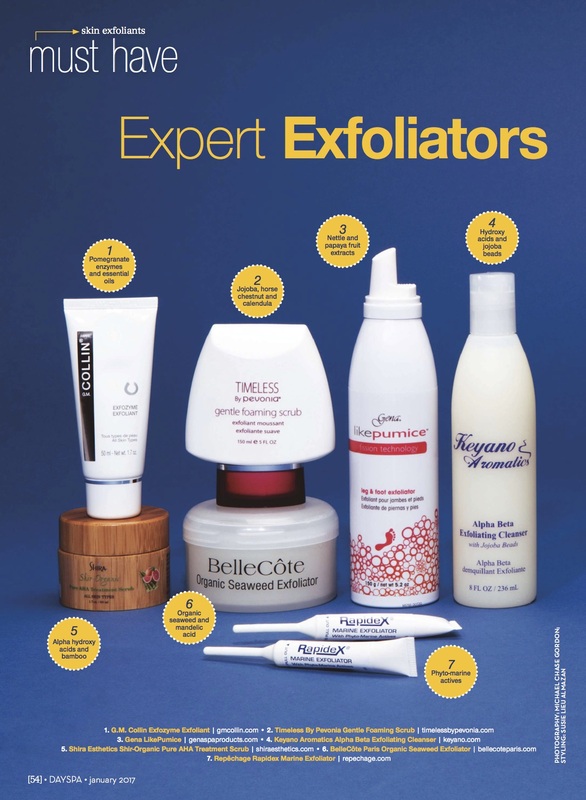 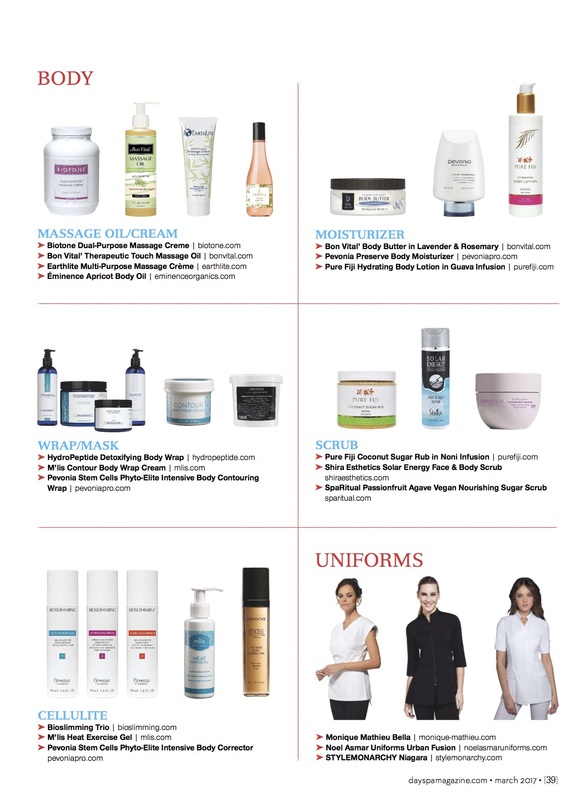 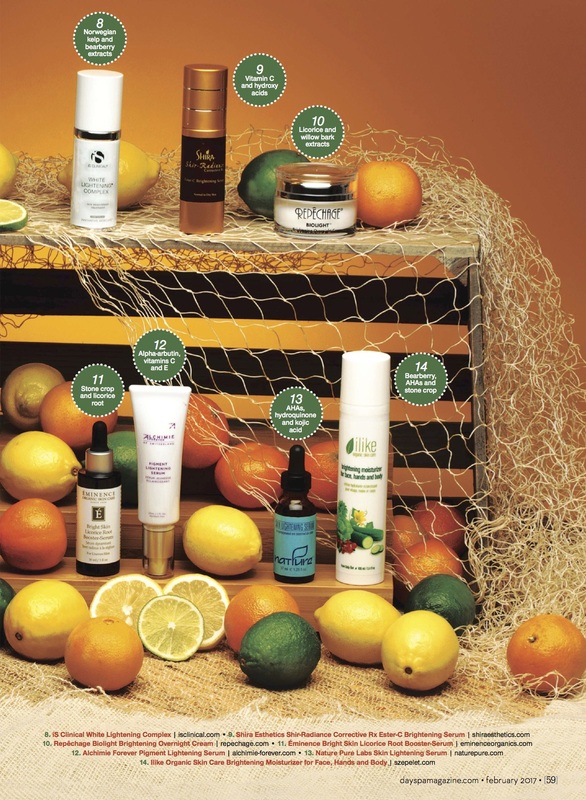 Shir-Organic AHA Scrub was included on page 54 as part of a featured round up of exfoliators. 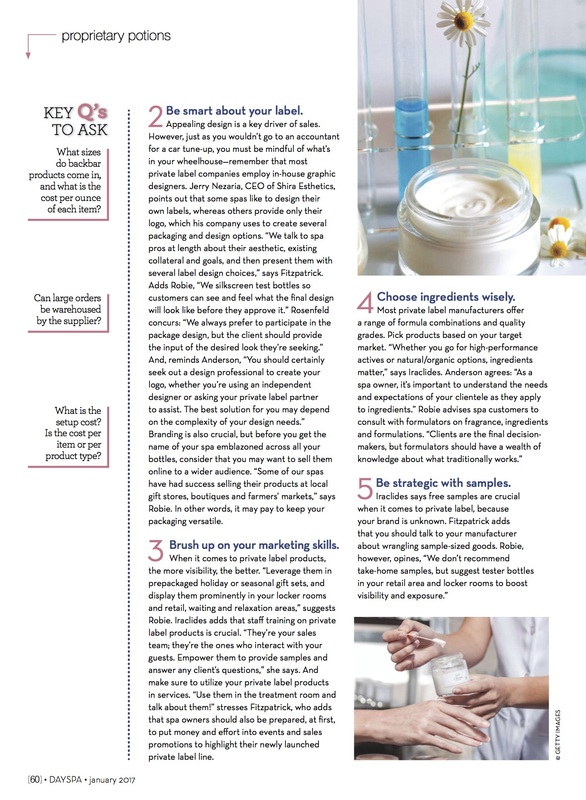 “Be Smart About Your Label” quote from Jerry Nezaria, President of Shira on page 61. “Retail Online” and “Stay Focused on the Endgame” quote/mentions from Jerry Nezaria, President of Shira on page 63. 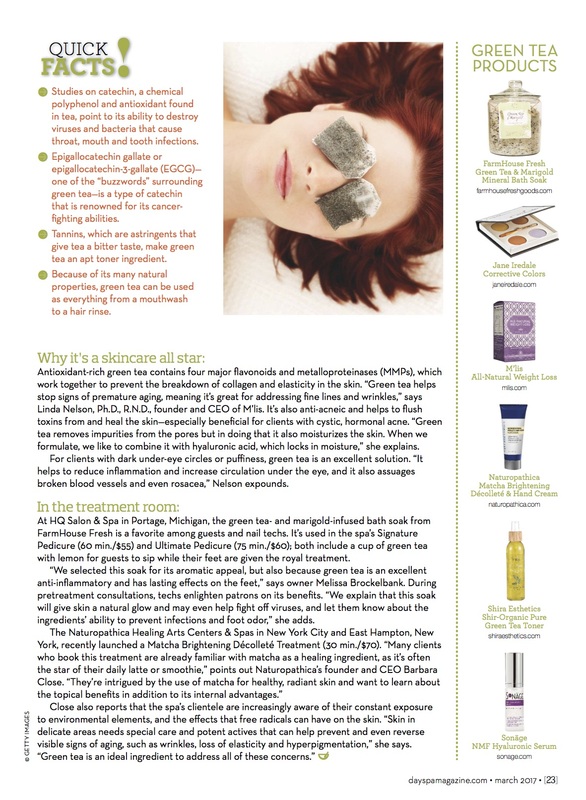 Our Shir-Organic Green Tea Toner was included in an article on page 23 about Green Tea. The Shir-Organic collection is awarded a Professional Choice Award on page 36. 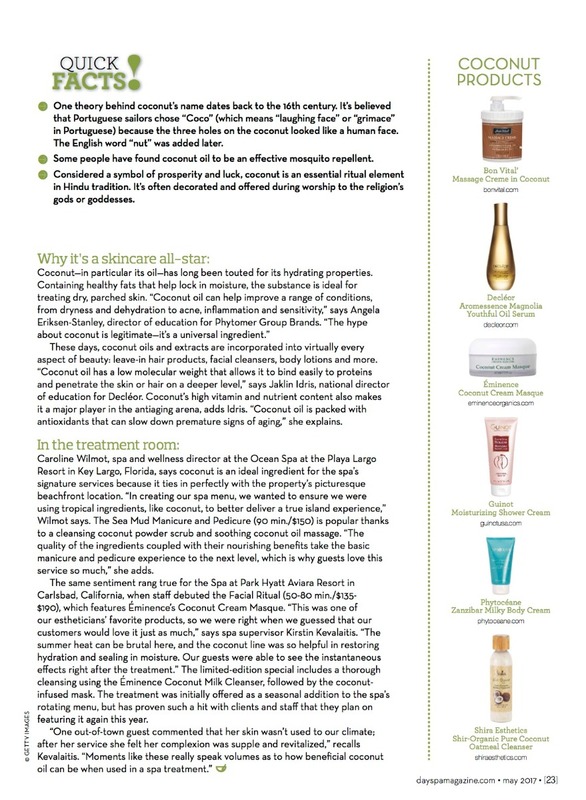 Our Shir-Organic Coconut Oatmeal Cleanser was mentioned in an article about Coconut on page 23. 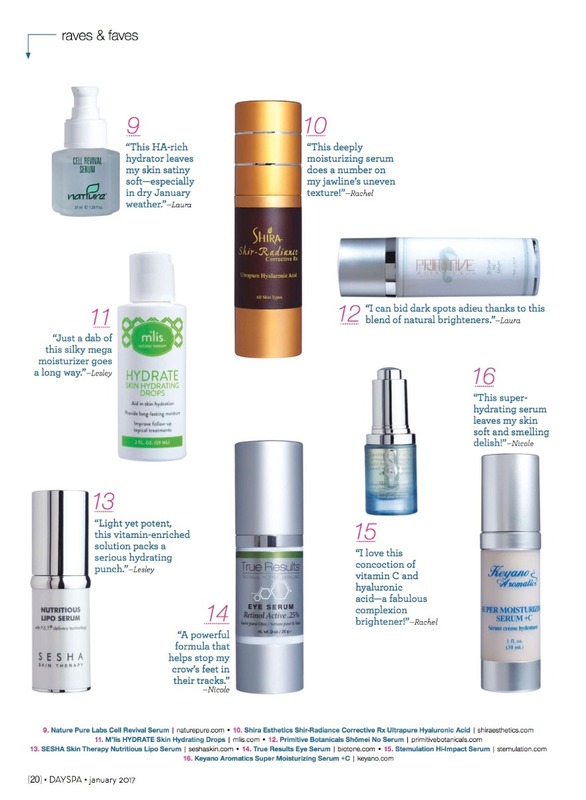 Our Shir-Radiance Ester-C Collagen Moisturizer is on page 16 in the Raves & Faves section. 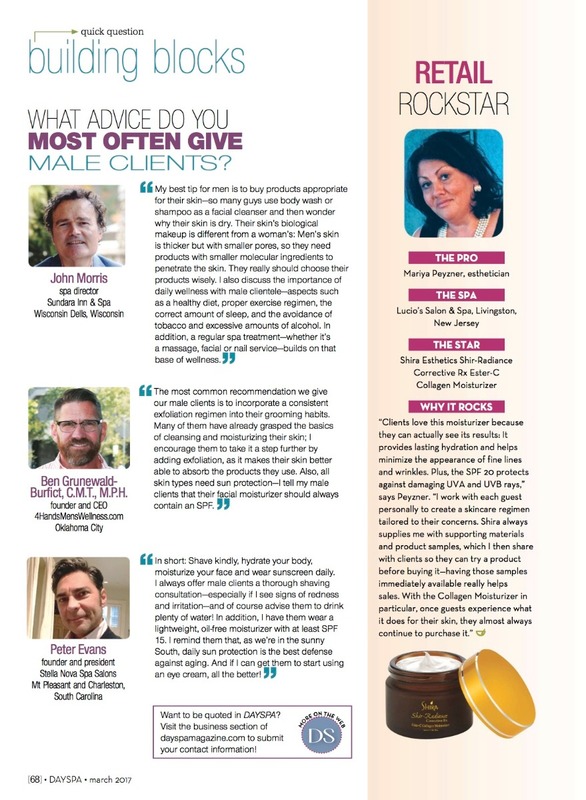 Jordanna Antonoff, Licensed Esthetician, was mentioned on page 47 discussing how to determine the level of dehydration of the skin. 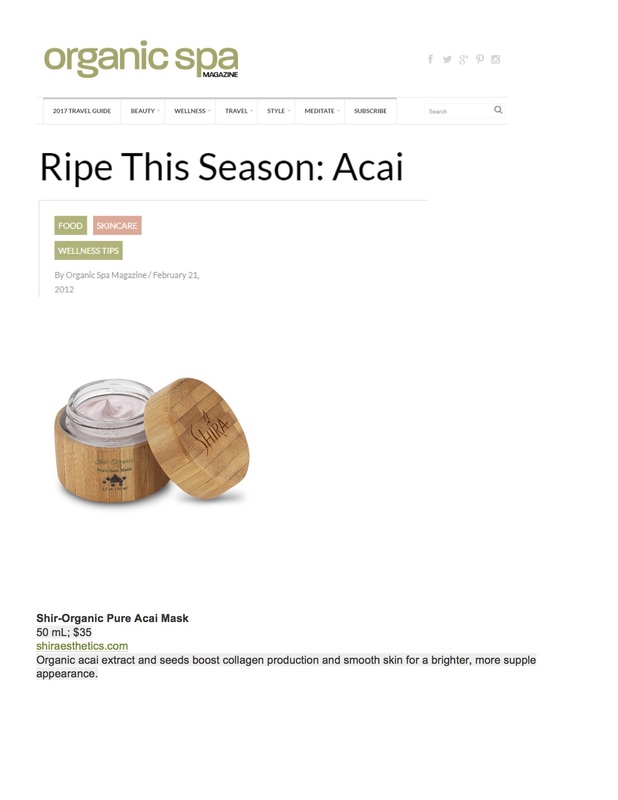 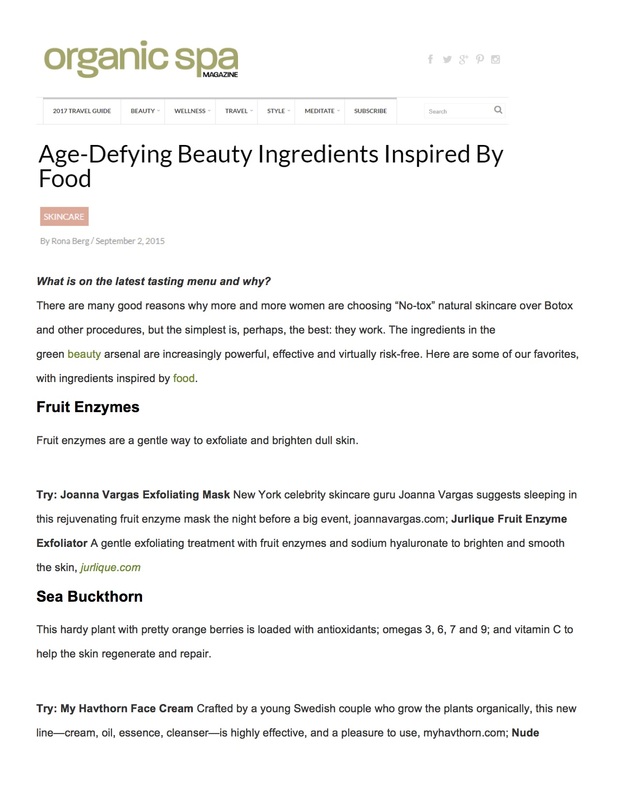 Our Shir-Organic Acai Mask was featured in an article about Acai berries and skin care. 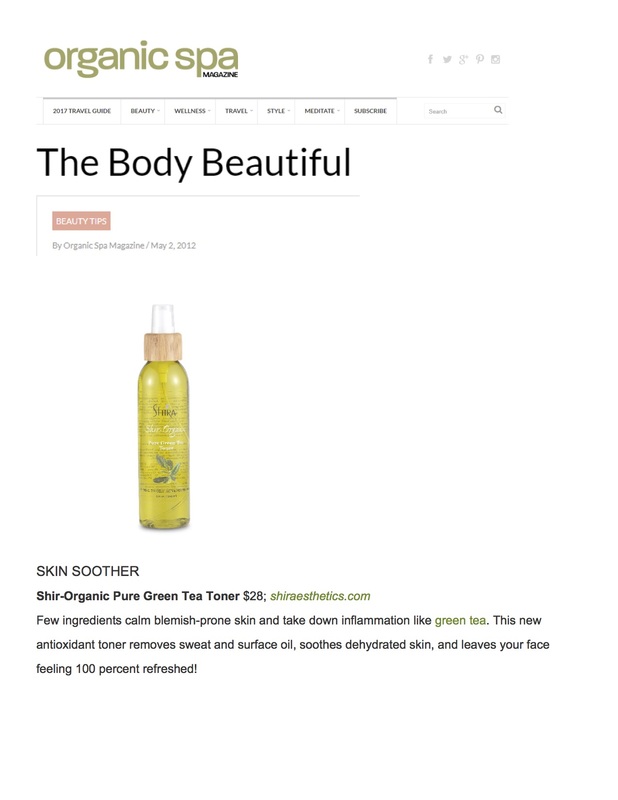 Our Shir-Organic Green Tea Toner was featured in an online article about products that are good to use in the Spring. 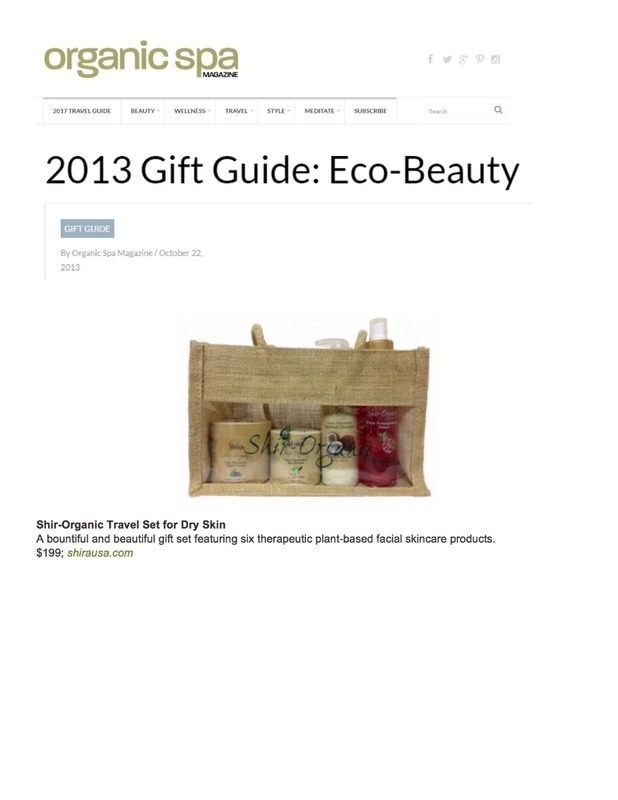 For the 2013 Gift Guide, the Shir Organic travel set including Shir-Organic Blueberry Night Cream, Shir-Organic Cucumber Eye Cream, Shir-Organic Coconut Oatmeal Cleanser and Shir Organic Pomegranate Toner in a jute bag were featured. 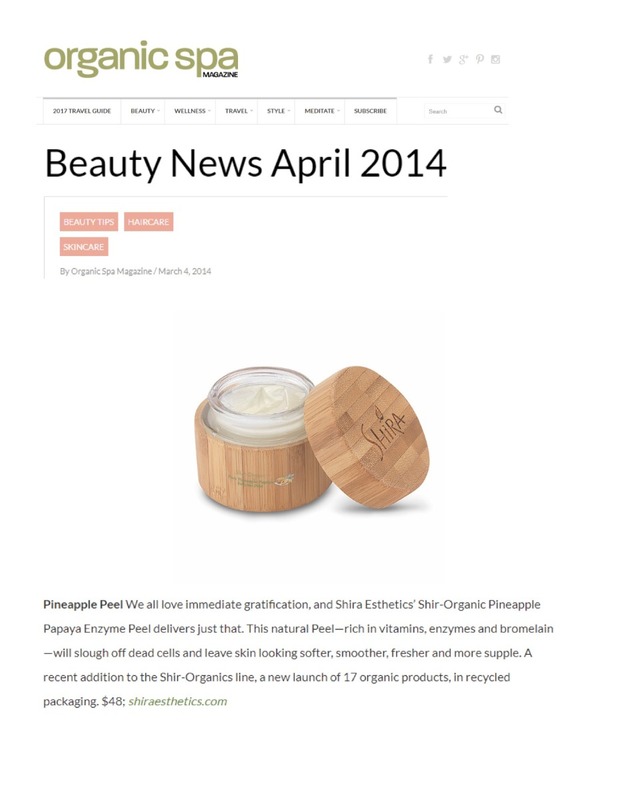 As part of their Beauty News article, Organic Spa included our Shir-Organic Pineapple Papaya Enzyme Peel as a great item that leaves skin softer and smoother! 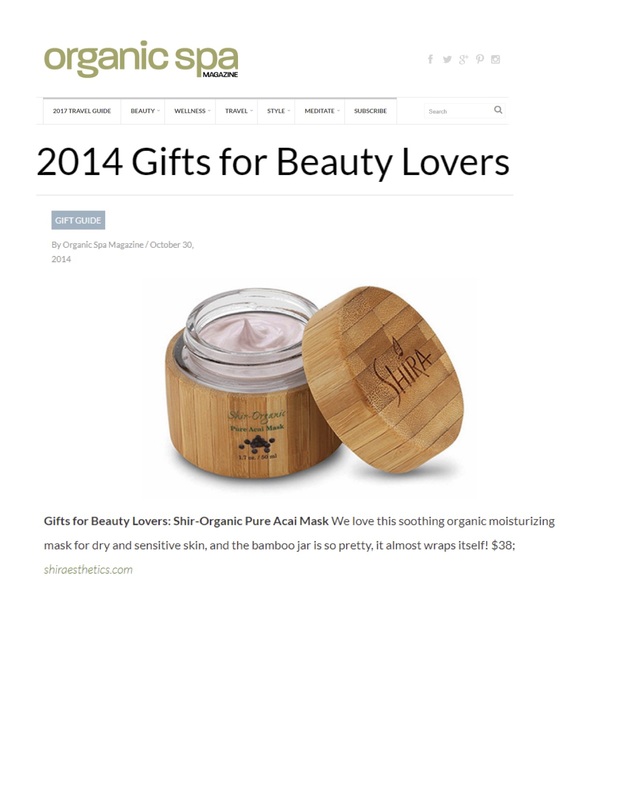 2014 Gifts for Beauty Lovers included the Shir-Organic Acai Mask and commented on the beautiful bamboo jars. 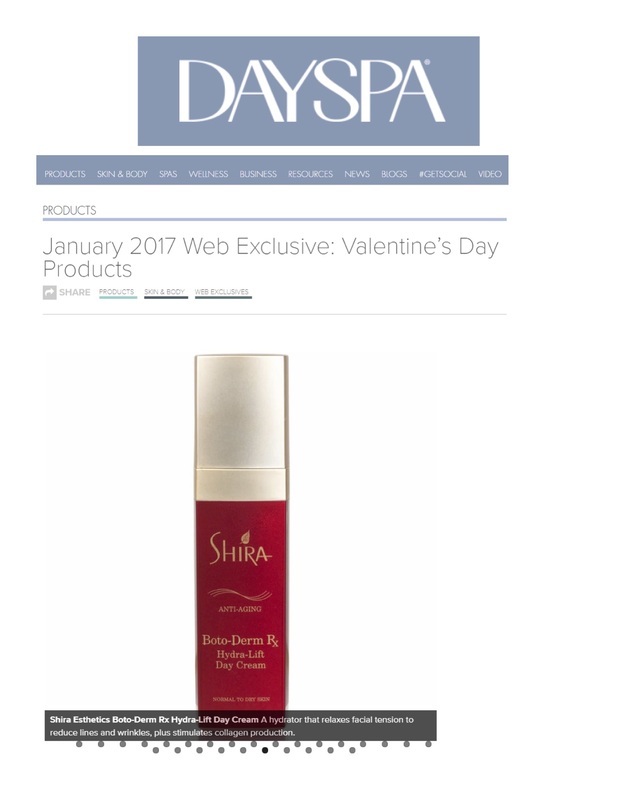 Organic Spa tells its readers that the Shir-Organic Green Algae Soothing Gel is a calming gel that eases inflammation and encourage cell turnover!